Dell announced the launch of its Dell STORM outreach to increase the scope of its coverage and influence to 117 tiers 2 and tier 3 cities across the country. The program was launched as part of the activities surrounding Dell’s renewed distribution focus that was announced earlier this year. Dell has partnered with Distribution partner Ingram Micro for the outreach. Dell currently has over 2,000 channel partners and is looking to increase this number to strengthen and broaden its coverage reach. With the new strategy Dell aims to reach out to 300 additional channel partners & System Integrators across the country. Dell and Ingram will be reaching out to channel partners in 36 locations of the North and South of India each, 26 locations of the West and 19 of the east. The objective of the outreach is to help attain maximum coverage and scale up business in future by reaching out to more partners. Dell has partnered with 31 branches of Ingram Micro to strengthen its outreach in these location and aims to sell the business class desktops and notebooks including DellOptiPlex Micro based on Intel dual core, OptiPlex Dual core SFF and Latitude i3 at better price points. As part of the activities planned Dell will be giving Sales Reps of Channel Partner organizations the Dell Storm kit for their enablement. Dell’s renewed distribution focus is aimed at driving growth in the commercial business and increasing the availability of its end-to-end solutions across the country. Since then Dell has partnered with distribution partners Ingram Micro, Redington and Iris to improve the coverage of its commercial products and solutions. AMD unveiled a broad range of graphics solutions designed for professionals and gaming enthusiasts at the AMD Technology Showcase 2014 in Vivanta by Taj, Fort Aguada, Goa. The event witnessed the presence of key global spokespeople – Raja Koduri, Corporate Vice President, Visual Computing, AMD and Richard Huddy, Chief Gaming Scientist, AMD sharing some of the significant announcements with a special focus on graphics. Furthermore, the company commemorated its 30 years of leadership in graphics and gaming highlighting its graphic strategy for the Asia-Pacific Japan (APJ) region. The new range of AMD FirePro W-series professional graphic cards – W8100 and W9100 are designed for desktop-workstations and personal supercomputers featuring active cooling for flexible deployment in a wide variety of systems. While the AMD Radeon R9 285 Series is the pinnacle of price/performance gaming hardware at 2560X1440p delivering real-time experience to ultra-enthusiasts at the apex of PC gaming. AMD has been on the front lines of graphics innovation for years, backing developers’ creative genius with the technology and firepower. Coupled with AMD’s latest Graphics Core Next (GCN) Architecture at its core, AMDRadeon and FirePro efficiently balance compute tasks with 3D workloads and enabling multi-tasking. AMD’s graphic solutions for both consumers and professionals are evolving everyday with unrivaled advantages including Mantle, TrueAudio, Eyefinity, Crossfire and TressFX, all industry-changing technologies developed by the company. ASRock announced that the company became a Sponsor of the Taipei Cricket Association (TCA). Established in 1985, Taipei Cricket Association, commonly known as TCA is the first Private Cricket Club based in Taipei, Taiwan (ROC). The club mostly comprises of amateur cricket players who gather every week at the TCA home ground for practice sessions and also friendly matches with other clubs. In Taiwan there are total 12 cricket teams with over 20 nationalities playing this sport right now. In recent years, ASRock well known for its Fatal1ty Killer Series motherboard which is tailor-made for enthusiastic gamers and its multiple e-sports sponsorship throughout international markets, such as Korea Incredible Miracle Team, Germany SK-Gaming Team and Taiwan Machi eSports. Besides, ASRock extends its care and resources beyond e-Sports to physical sports, such as sponsoring TCA and local high school baseball team in Taiwan. SanDisk Corporation launched its 512 GB SanDisk Extreme PRO SDXC UHS-I memory card, the world’s highest capacity SD card in the market. The new offering is designed to meet the demands of industry professionals who require the most advanced gear available for shooting 4K Ultra High Definition (3840x2160p) video, Full HD video (1920×1080) and high-speed burst mode photography. Built for the Pros Since SanDisk unveiled its first 512MB SD card in 2003, capacity demands have increased exponentially and the new 512GB SanDisk Extreme PRO SDXC UHS -I card represents a 1,000 –fold capacity increase in just over a decade, yet maintains the same size footprint. SanDisk’s most powerful and highest capacity SD UHS-I memory card yet , the 512GB card delivers write speeds up to 90 MB/s and UHS Speed Class 3 (U3) recording speed for high resolution, real -world color and stutter -free 4K Ultra HD video. Transfer speeds up to 95 MB/s move data quickly for efficient post-production workflow. The 512GB SanDisk Extreme PRO SDXC UHS-I card delivers both the speed and capacity needed to support 4K Ultra HD video capture , enabling users to shoot tremendous amounts of content without disrupting the moment. PQI has introduced the U605L Flash Drive globally, to allow consumers to enjoy the final days of a wonderful summer and experience the joy and beauty of summertime in all its splendor. The globally launched U605L Flash Drive was designed with the concept of “Exploring the World in a Boat” in mind, presenting a classic style of ocean and sea. The PQI U605L is small, lightweight, and extremely easy to carry around. It will easily fit in with your individual style and taste, and is the best accessory for your laptop computer. Although summer is coming to an end and autumn is approaching, the PQI U605L will make you feel like you are still on the beach being caressed by the summer breeze. The U605L Flash Drive incorporates PQI’s patented exclusive COB packaging technology as well as a USB2.0 communication interface, not only solving the problem of overheating during data transfer, but also eliminating the issue of being unable to read data due to high-frequency noise. The U605L is perfect for use with thin and lightweight Ultrabooks, tablets, or laptop computers. The U605L Flash Drive’s design is based on a classic seafaring look and style. The body of the flash drive is made from silicone, while its cute and playful design also provides protection for the drive. The U605L’s capacity ranges from 4G to 32G to suit the needs of different customers. PQI’s patented COB unique packaging technology is both waterproof and shockproof, protecting your data from water damage and giving you peace of mind. The thoughtful bottom plug design is not only cute and playful, but also provides useful functionality that prevents the cap from being lost. Looking at the U605L Flash Drive’s classic seafaring style and design, you will feel as if you were on a stretch of a beach with golden sand, with the beautiful deep-blue sea right in front of your eyes; a boat flows past you and a sailor is singing with a smile on his face. The PQI U605L Flash Drive’s “sailor in the ocean” style and design along with its red and blue colors lets you enjoy a bit of fun in your busy and hectic life, as if you were enjoying a comfortable ocean breeze! The new application streamlines the initial setup process, provides single point management, facilitates smart and true integration and, of course, come entirely free of cost, unlike other players. “Biggest challenge for MSME businesses deploying a network is that networking devices like switches or Wi-Fi APs come with a static default IP address for management or need to configure a DHCP environment for these devices. This promotes need to take time and patience to power up and then assign IP addresses to dozens of devices. ZyXEL ONE Network (ZON) is one clear solution to that,” says Gurnek Singh Thiara, senior technocrat at ZyXEL, New Delhi. Gurnek says that presently, administrators have to power up each device to change IP settings repeatedly, or use several utilities or heavy NMS to deploy a network as well as to add new devices to the current network. The ZON utility not only enables auto-discovery of ZyXEL devices across different product ranges instantly, but also displays detailed device information once it is plugged to the infrastructure. This new breakthrough allows network setup through the single-point interface that significantly reduces complexity and time spent on repetitive settings. Vide ‘Single-Point Management’ system, ZON also focuses to axe out complications and time-consumptions arising out of increasing devices on the network. “The ZON utility features smart functions to assist network management for administrators to perform batch firmware upgrade for devices, remote reboot of devices such as ceiling APs or redirect to device GUI for further configuration with just a click. These troublesome but necessary management tasks can now be easily done through just one platform for Wi-Fi APs, switches and gateways,” says Gurnek. The 25 year-old networking brand that tirelessly endeavoured to add another key feature to ZON -Smart and true integration. The utility not only eases the initial setup and future management for devices, but also brings access point information to the ZAC with just one click on a button of the ZON utility; with which administrators can configure multiple AP profiles including SSID, security, RADIUS, MAC filter and L2 isolation centrally. The seamless integration between ZON utility and ZAC facilitates network device management and the entire AP setup process. Though PC gaming is still a fledgling sector in India, it has started showing signs of coming of age. This can be mainly attributed to those champion gamers who have not only excelled at the national level, but also have made a mark at the international level, representing India with success. The common factors that unite them, in addition to excellent gaming skills and a never-say-die attitude, are quick decision-making, faster reflexes, better agility, and improved hand-eye coordination. And of course, a high performance gaming PC with hardware components that perfectly complement these factors. Talking about components, it is the motherboard, being the central hub of the PC, that allow all other plugged-in components to communicate and perform successfully with each other. In other words, the quality and performance of the motherboard, to a large extent, influences the performance of the PC and also, the gamer. “I have been using GIGABYTE motherboards since five years, and currently am using GA-Z87M-D3H with the Intel Core i5 4670 processor. They have top-notch build quality, are very durable, and result in winning performances. Gigabyte Launches GA-X99-UD5 WIFI Motherboard under GIGABYTE Technology’s latest X99 motherboard line-up, which is based on the Intel X99 chipset. The series comes with support for Intel’s new Core i7 Extreme Edition (LGA 2011-v3 socket) processors and latest DDR4 memory. The GIGABYTE X99 motherboards boast a unique PCI Express design that utilizes 100% of all 40 lanes from the CPU when in a 4-Way or 3-Way graphics configuration. This is possible because of the onboard external clock generator combined with the direct connection of one of the x16 lanes to the CPU. It should be noted here that standard designs limit all 4 main PCIe lanes to ONLY x8 (64Gb/s) bandwidth. In simpler terms, with the aforementioned features, GIGABYTE X99 motherboards can unlock the best possible bandwidth to the user, whether it is for extreme gaming or graphic-intensive activities. GA-X99-UD5 WIFI features with a wide range of features to make overclocking easy. These include Single BIOS Mode Switch / DualBIOS Mode Switch, Onboard Power Button that puts users in the driver’s seat when experimenting with different hardware configurations, and an Onboard Restart Button that allows for fast system reboots when troubleshooting. Another key feature of this motherboard is the GIGABYTE Q-Flash Plus that allows users to update to the latest BIOS using a thumb drive without the CPU or memory needing to be installed. By simply downloading the latest BIOS and renaming it on a USB thumb drive, and plugging it into the dedicated port, you can now flash the BIOS automatically without the need to press any buttons or even the need of onboard memory or CPU. Born from nearly two decades of dedication to the design and manufacturing of the world’s best performing gaming products, GALAXY and its European brand KFA2 has announced their global unification, officially merging to form GALAX. Originally founded in 1994, GALAXY built its reputation as the behind-the-scenes designer and manufacturer of many of the most popular OEM-branded graphic card products on the market. Since 2000, GALAXY introduced numerous critically-acclaimed products including the world renowned "Hall of Fame" series with custom white PCBs and record breaking performance. GALAX will continue providing all current levels of service and support to all Galaxy/KFA2 customers, and will of course honour all Galaxy/KFA2 warranties to their full extent. Asus is holding its annual channel meet in Goa from September 18th to 21st, 2014. Over 160 partners are attending this meet including Partners, Regional Distributors, national Distributors, Branch Heads, Head Office and Territory ProductManagers. The partners will encounter a mix of entertainment along with the corporate interactive session with product and process updates for Asus Gold Partners,Asus Wholesale Partners, Asus Exclusive Stores, Regional Distributors and partners. The event is being hosted at The Lalit Golf & Spa Resort, Goa.The first day of the meet witnessed performances by celebrated comedian Sunil Pal and dancers from India’s Got Talent. The meet has been organised to reward the partners on successful completion of the targets to be as primary partner and be part of the tour along with ASUS Wholesale Partners, National Distributors & Regional Distributors. The tour will also highlight the recently launched Asus products to the channel partners. The demonstrations during the meet will enhance the knowledge on the products and also gave partners an opportunity to personally interact with the speaker. In recent times D-Link’s focused segment-wise business approach has lead the company to astounding success. Since last couple of years, D-Link - the end-to-end networking solutions provider for consumers and businesses has strategically targeted product segments & business verticals that have brought compounded annual growth. Following suit, D-Link (India) Ltd. shall now extend its focus on Network Storage business. As part of company strategy to extend its Network Storage Business line, D-Link at its recently concluded channel/ System Integrator meet in Mumbai presented its business & distribution model for network storage. Additionally D-Link also introduced a range of Network Storage devices for businesses and Enterprises, that are engineered for performance, flexibility, improved productivity, mitigate risk, simplify management and lower overall cost of ownership. As part of focussed approach, D-Link has introduced value added distribution at regional level namely D-Link Storage Principal, which will enable the solution oriented channel of D-Link Storage Plus Partner base in the respective region. SanDisk Corporation, a global leader in flash storage solutions, today announced the world’s fastest microSD UHS-I memory card, the 64GB** SanDisk Extreme PRO® microSDXC™ UHS-I card. The company also recently announced the 512GB SanDisk Extreme PRO SDXC™ UHS-I card, the world’s highest capacity full-sized SD™ memory card. These new offerings expand the company’s impressive portfolio of 4K Ultra High Definition (3840x2160p)1 capable products. For more than 25 years, SanDisk has been committed to delivering breakthrough technologies that expand the possibilities of storage. 4K Ultra HD video resolution is the next generation of video quality ushering a new era of consumer devices that require fast, reliable storage as a core enabling component. The exceptional resolution that 4K Ultra HD video delivers comes at the expense of very large files that can reach up to four times the size of a Full HD (1080p) video file. The SanDisk Extreme PRO microSDXC UHS-I card, the fastest microSD UHS-I memory card in the world, now comes with up to 64GB of storage to address consumers’ desire to generate high quality 4K Ultra HD content. With transfer speeds of up to 95MB/s*, users can shoot like a pro and still experience world-class responsiveness from their smartphone, tablet or action camera. The card also features Class 10 and UHS Speed Class 3 (U3) ratings, which are recommended by the SD Association for 4K Ultra HD video capture. “4K video capture is being implemented in smartphones and ‘prosumer’ cameras and camcorders much more quickly than was the case when HD was launched. SanDisk understands where the market is headed and has the foresight to create solutions that enable optimal video capture and sharing across multiple host devices," said Chris Chute, vice president, SMB Cloud & Mobility, IDC. The SanDisk Extreme, SanDisk Extreme PLUS and SanDisk Extreme PRO microSDHC™/microSDXC memory card families have been upgraded to the U3 standard to deliver 4K Ultra HD. The new 512GB SanDisk Extreme PRO SDXC UHS-I card, the world’s highest capacity SD card, will allow users to capture more video and photos on an SD card than ever before. The SanDisk Extreme PRO SSDs deliver 24/7 consistent pro-level performance for the most demanding and graphics-intensive applications, and are now qualified by Atomos and Blackmagic Design, two industry pioneers, for 4K RAW and 4K ProRes capture. In continuing with Season II of CAMPUS BUDDIES - its characteristic brand property, neoteric infomatique ltd. will visit HL College of Commerce in Ahmedabad on the 23rd of September and Poona College and Desai College in Pune on the 25th of September. fort of their own college premises. It will showcase an array of laptops, desktops, notebooks, accessories, Flash & HDD, UPS etc. from leading brands, alongside warranty, post warranty, spares and repairs services from F1 Info Solutions & Services. The CAMPUS BUDDIES Team will demonstrate product features and address the students’ queries on products and services. Earlier in August, neoteric had kicked off with Season II parallely in the Sinhgad Institute of Management in Kondwa- Pune and L.D. College of Engineering, Ahmedabad. Season I (conducted last year) had covered Sikkim Manipal University and T.M.A Pai Foundation Polyclinic in Karnataka. PNY has officially announced the release of the new package of HP microSDXC C10 (64G) cards for unlimited storage space for your mobile devices. Now increase the storage capacity of your digital camera, smartphones and tablet PCs. Do more with HP microSDXC cards, which ensures reliable, high-capacity performance that allows you to store HD videos, graphic rich images, songs, movies, apps and more. In today’s mobile world, digital media can be accessed through all mobile devices and we’re all trying to store more and more content. 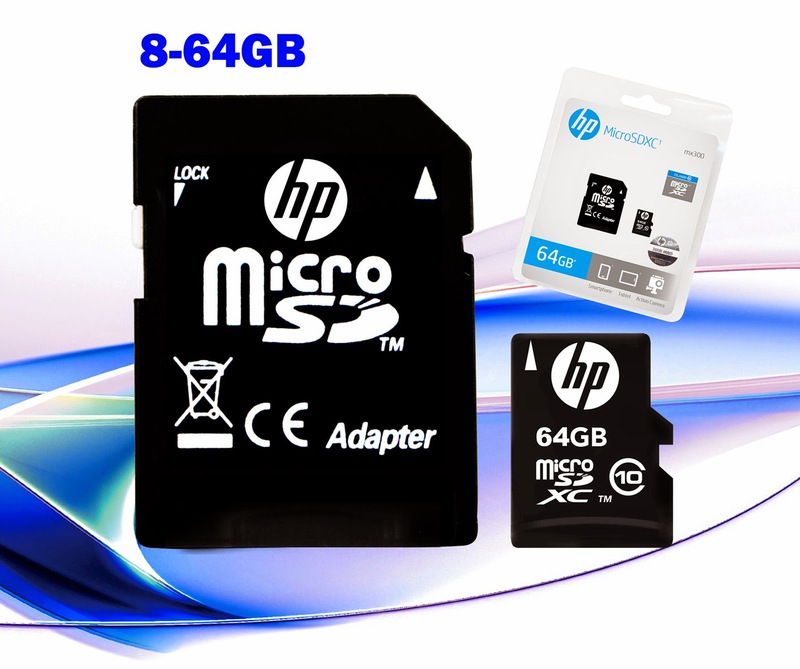 Available in 8-64 GB capacity, HP microSD C10 maximizes your mobile entertainment so that you can download and store a huge number of media files without running out of memory space. The HP microSDXC C10 cards give you the ability to store up to 5 and14 hours of full HD and HD videos, 11, 837 songs and 28,445 images. High speed flash memory ensures you capture, record and store digital content with up to 10MB/sec transfer speed and Class 10 speed rating. Expand your device’s memory space simply by plugging in the HP microSD C10 card and enjoy portable storage at school or work. By using the included microSD card to adapter, you can also use the microSD card in any SD slot equipped camera, card reader, computer, laptops and printers. The HP microSDXC C10 promises a limited warranty of one year from the date of purchase and is available at an affordable price. PNY, the leading manufacturer of memory products and PC peripherals, is pleased to announce the package of OTG Robot and Micro M2 USB Drive. PNY OTG Robot can basically plug any PC peripheral to such a port on the device, which acts as a USB host similar to a PC with a USB port, This allows one to transfer data directly to the USB drive without having to make use of a computer. Also, this is very convenient because one can do it on the move, just about anywhere. Using USB OTG Robot, one will finally be able to get to do something more productive on the Android Smartphone or tablets by connecting a USB keyboard/mouse combo and enjoy the freedom to type and do things faster. A mouse connected via OTG allows better cursor control than using one finger on the touch screen; especially when one don't want any part of the screen to be obstructed by the finger. Also, a large-size dedicated keyboard allows to type faster than can do on the on-screen keyboard, and again, it avoids obstructing the screen view with the fingers. With most Android phones being fast enough to support interesting games, one can really take control of gaming by attaching a USB joystick and enjoy a competitive edge over your competitors. Once again, while it is possible to play most games using on-screen controls, a joystick allows one to view the entire screen because one don't have to obstruct the screen with the hands. The micro-USB port can be connected to your Android Smartphone/tablet, while any USB 2.0 compatible peripheral can be plugged into the other end to work with your Android device. Its tiny size and light weight makes it very portable. PNY Micro M2 is their smallest USB drive; this pint-sized USB is extremely small and compact, no bigger than the size of a coin. The Micro M2 weighs only 1.8g, and is therefore perfect to carry all your personal media files. Its portability is enhanced with a lanyard loop opening located at the head of the USB, which can be attached to key chains, bags and other accessories. Its ultra-small and compact size fits discretely into laptops, notebooks, tablet PCs and other portable devices without getting in the way in general use. The PNY OTG Robot is available as a bundle with the very successful and popular PNY Micro M2 flash drive. 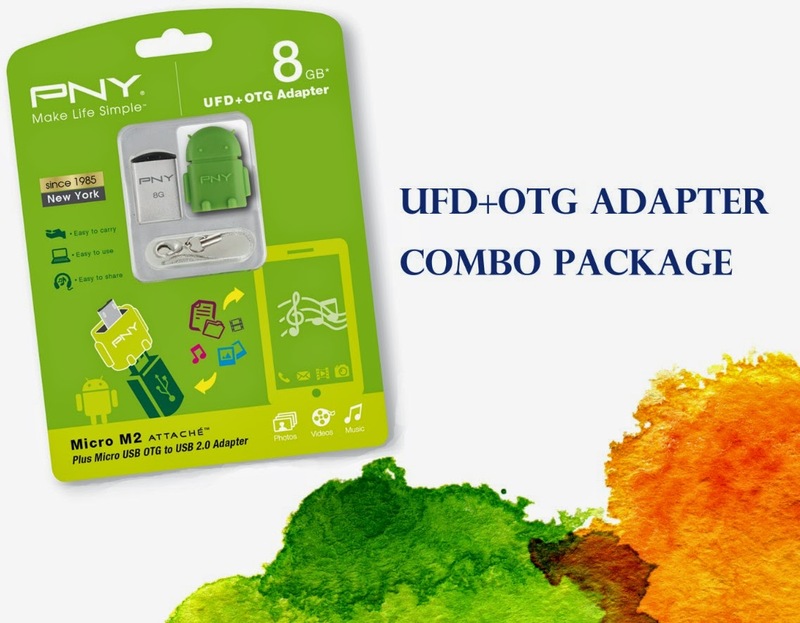 This is a perfect combination that allows you to expand the storage of your Android device by connecting the flash drive and the Android device via the OTG adapter. You can also plug in USB drives with FAT file system or USB card readers. The device is available in green and black colours. PNY OTG Robot works with devices running Android 4.0 and above, and come with a 1-year limited warranty. The Micro M2 is operational with Windows 2000, XP, Vista, 7, 8, and Mac OS: 10.3 and above. It is backed up with a limited warranty of 5 years.